Lunch in Paris. 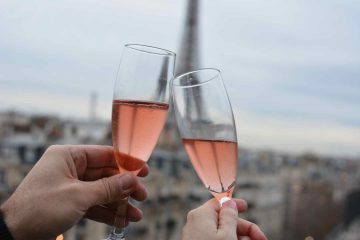 There’s arguably no city more magical for enjoying a meal while taking in your surroundings, from the Parisians enjoying everyday life in the city to ancient architecture that remains some of the most fascinating in the world. Palais Garnier is one of those pieces of architecture, and enjoying a meal while overlooking it on a gorgeous day in the city is nothing short of magical. These are 13 places where you can eat near the opera in Paris. 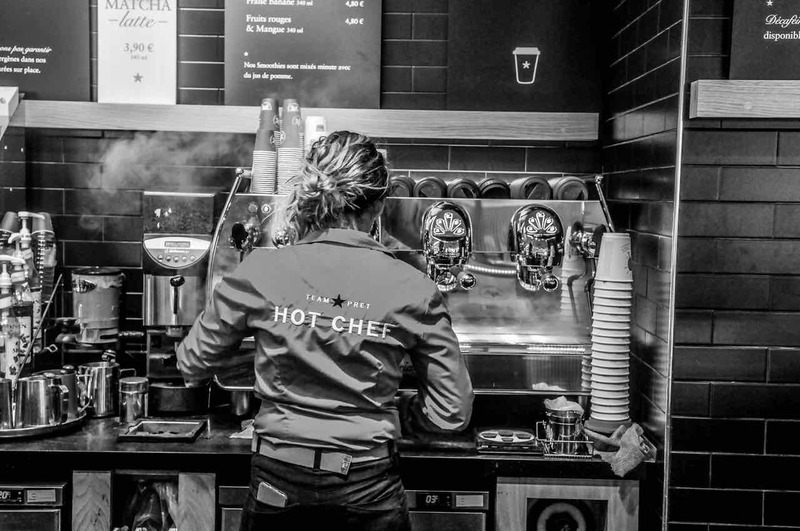 Indulge in the latest place to eat at Haussman, the YC Cafe by esteemed chef and baker Yann Couvreur. It’s the pastry chef’s first cafe inside a department store in Paris, and it’s an ideal place to stop for a savory lunch, brunch, or an afternoon tea accompanied by a sweet treat. Every hamburger served at Big Fernand is made from products sourced from the many regions of France. Raw milk cheeses, homemade sauces, French meats, and the chef’s exclusive bread recipe combine to create what may be the best burger you’ve ever eaten. Find these burgers, homemade fries, and decadent desserts on the first floor of L’Homme. Tasting boutiques are some of the best places to sample the many flavors of Paris, and there’s no better one to try than the Petrossian Caviar at Lafayette Gourmet. Found on the ground floor of the Lafayette Maison and Gourmet, Petrossian offers all of their flagship products, like Russian-style herrings, Tarama with Maviar, and Caviar Alverta Royal. Head to the sixth floor of the Coupole for some of the best views of Paris at the Lafayette Cafe. Enjoy sandwiches, bagels, salads, pizza, hot lunches, pastas, and a wide selection of other dishes and drinks at this cafeteria known for offering a variety of flavors with an unforgettable view. Cafeteria service begins at 11 a.m., but you can purchase take-away foods as early as 9:30 a.m. Pig is always on special at 5 Jotas, and whichever dish you choose, you’re bound to be blown away. Taste the Pata Negra pure Iberian ham, red wine braised pig cheeks, chorizo, black pudding, or sausage. 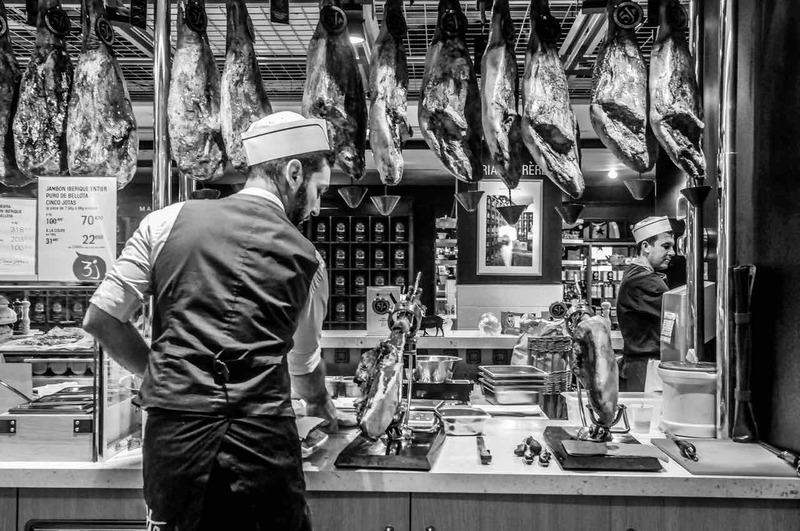 Dine on the finest Spanish hams here on the ground floor of the Lafayette Maison and Gourmet, and you’ll want to return on every visit to the city. Visit Angelina, the sophisticated eatery on the first floor of Lafayette Dome, on Saturday, and you’ll enjoy one of the best brunches of your life. But don’t be discouraged if your visit falls on another day of the week. Angelina always serves superb teas, club sandwiches, salads, and mouthwatering desserts, like the famous Mont-Blanc cake. There’s always something new happening under the dome, and Bar Kaspia is one of the latest dining areas. 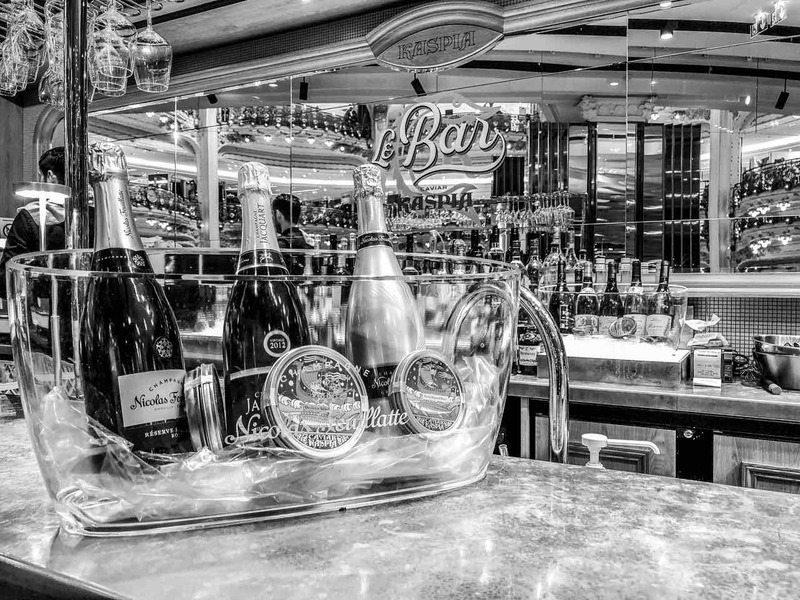 Dine on specialties like smoked salmon, caviar, or lobster soup while sipping a fine glass of champagne or fresh fruit juice. Found on the first floor of the Lafayette Coupole, this new favorite won’t be going anywhere soon. Top quality meats are the specialty at Steak Point, in the heart of the Lafayette Gourmet. Watch the chef cook your burger in front of you, snack on meat tartares, dine on succulent steaks, and enjoy unlimited chips. Meat lovers will find exactly what they’re seeking here. Not a meat lover? 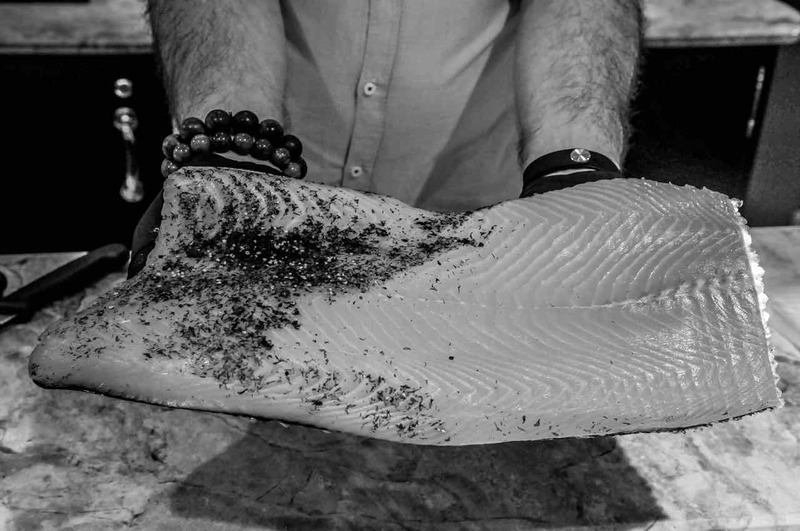 Fish Point, inside the Lafayette Gourmet, is an ideal alternative to Steak Point for those who prefer fish, crustaceans, and shellfish to heartier meats. 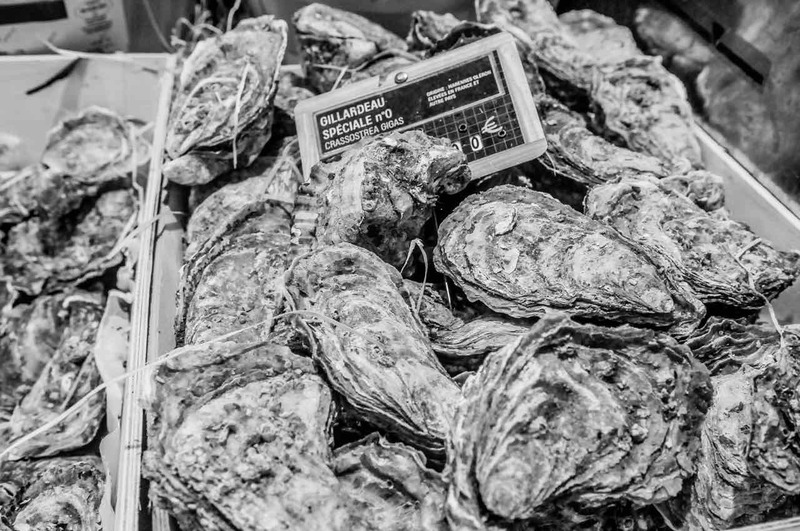 This escape to the sea can be found on the ground floor of the Lafayette Maison and Gourmet, and specialties include the seafood platter, a selection of oysters from renowned regions, raw fish, and king crab. Travel around the world in a single bite at Panasia. Taste daily fusions of flavors inspired by a variety of cultures and countries around the globe, like Khao Pad Kong, Nasi Goreng, and Stir-fry Ramen. Don’t forget to taste the authentic bubble tea while dining at this favorite eatery on the sixth floor of the Coupole. 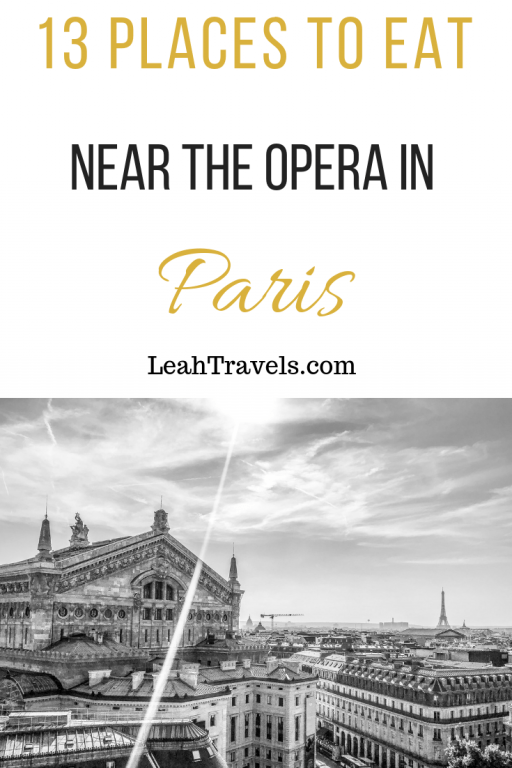 It’s a go-to place to eat near the Opera in Paris. 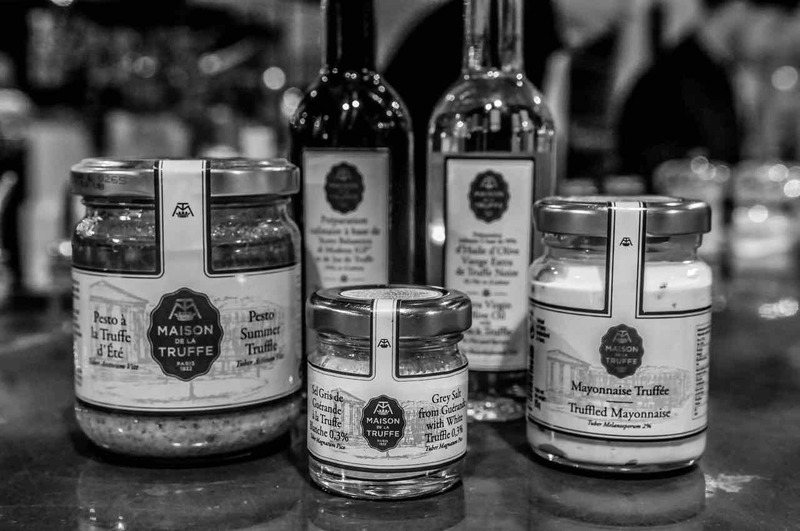 Street food at its finest — La Maison de la Truffe invites you to enjoy traditional street foods, like hot dogs and hamburgers, that have been elevated with unique ingredients like black melanosporum truffle and dill cream. 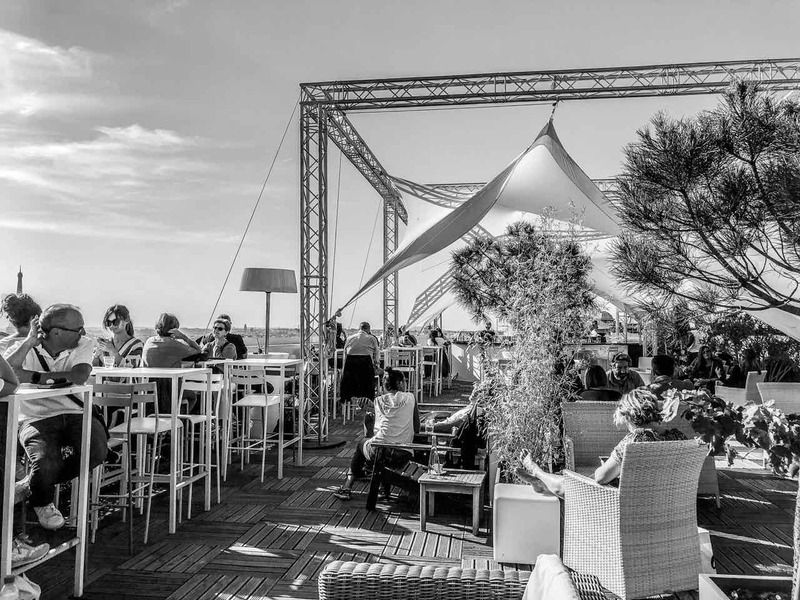 The restaurant is located on the ground floor of le Gourmet, and you can dine at the counter or take your meal to the rooftop of the Coupole store to enjoy while overlooking the city. Pick up some truffle oils, salts, and other products while you’re there. Take a fresh salad from Jour to the steps of the opera or the rooftop of the coupla store, and this may be your favorite lunch in Paris. Choose from nine hot or cold bases, a whopping 47 toppings, and 12 dressings for your mouthwatering made-to-order salad. Fresh fruit juices, wraps, quiches, muffins, cookies, and other treats are available here at Jour, on the ground floor of L’Homme, as well. Pret a Manger is a quick, easy, and delicious place to grab a sandwich, baguette, or soup to enjoy on the steps of the Palais Garnier. All sandwiches and baguettes are made-to-order, so you can enjoy a fresh meal with quality ingredients on the go. This post is brought to you by Galeries Lafayette. That’s a really useful list of places to eat, though I do wonder if Pret a Manger is the same as the UK one…? The Steak Point and Fish Point sound good and La Maison de Truffe sounds like my idea of heaven. Your post just made me realize it was time to plan a trip back to Paris. Big Fernand will be great to remember when I am craving a great hamburger. Lafayette Cafe would be great for the view. We are always looking for good brunch options, so will remember Angelina. And a spot like Jour with 47 toppings for my salad will be welcome after the rich desserts in Paris. I am now both hungry. And craving a return to Paris. Thanks! Love your black and white photography. It adds a different vibe to a lot of these places I’ve been to before. Fish Point is particularly tempting as we are in oyster season 🙂 I’m headed back to Paris in December and I look forward to checking out cafe Lafayette. We have Big Fernand in Bordeaux too, but I’ve never tried it. Might have to check them out because you make the burgers sound incredible! The Spanish ham and Russian style herring sound good but… when in Paris. I think I would go for Big Ferdinand so I could explore the French countryside cuisine. I remember something in history class about Ferdinand being the king of Spain, but I don’t want to overthink this. Hello, Big Fernand is a very good address, indeed ! Thanks for these tips that I didn’t know. See you !